Retire and enjoy gracious and charming living in the Gatherings at Wellington. An active adult community located in the chic and sophisticated city of Manassas, Virginia. It's the best of both worlds. 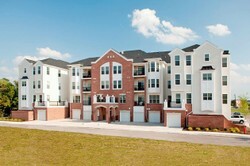 Condominiums designed with Baby Boomer needs in mind, but within walking distance of the Historic Old Town Manassas. The Gatherings at Wellington is an elevator condominium development. Each unit is a single-floor with an open layout. Enjoy the tranquility of this adult retirement community or explore Manassas shopping, volunteer at a local museum, take courses at George Mason University or take in a race at the Old Dominion Speedway. Of course you are only a short drive from the Manassas National Battlefield. This is a city with so much to do and explore you'll truly enjoy every day. There are several home plans to choose from when you move into the Gatherings at Wellington. All feature 2 bedrooms, two bathrooms, and a private garage. The living space is all on one floor. Walk in to a foyer with the kitchen on the left. The dining room is in front and through that you can see the balcony. Walk through the dining room and to your left just before the balcony is the entrance to the master suite - a combination of sitting room, master bedroom, and master bath. As you enter the dining room look to your right and you'll see an small hall providing access to the second bedroom and bath. Walk in a the kitchen is on your right and a study or home office is on your left. The kitchen is open to the dining room which is straight ahead. Like the Aspen you'll see a balcony through the dining area. The master suite is to the right and the second bedroom and bath is to the left. Similar to the Aspen, just flipped. Walk in to the foyer and there's a bathroom to your right and utility closet to your left. Ahead is a living room, with an open floor plan. You can see through to a sunroom and dininng room. To the left of the living room is a study. Enter the enclosed ktichen and breakfast nook at the end of the living or dining area. The master bedroom and bath is to the rear of the home plan. CLICK HERE to see all the floor plans, square footage and pricing options. Manassas is only 32 miles west of Washington DC, so you know that you can always pop in to the city for dinner or dancing at night. During the day you can visit one of the dozens of museums. But truth be told, you'll find lots of things to do in Manassas. Antique shops and vintage stores rule the day in Old Town Manassas. You'll find lots of one-of-kind home furnishings to doll up your new home. But Manassas is most famous for hosting the First Battle of Bull Run on July 21, 1861 and the Second Battle of Bull Run from August 28 - August 30, 1862. Visit the Manassas National Battlefield Park, operated by the National Park Service. This beautiful Virginia landscape is a haunting tribute to the thousands of men who fought there. While the South won the battle both sides saw huge numbers of dead and wounded. The North had 460 killed, 1,124 wounded, and 1,312 missing or captured; Southern casualties included 387 killed, 1,582 wounded, and 13 missing. Until that point in US history, it was the bloodiest battle ever fought. In addition to the Battlefield Museum, the city of Manassas his its own museum. It's much more than a Civil War Museum. It tells the story of Northern Virginia Piedmont region through a fantastic display of authentic artifacts and documents. You'll spend hours learning about your new home. There are many ways to volunteer at the Manassas museum. Warm Virginia nights spent watching the races. It's one of my favorite things to do. It's great fun to go hang out and watch fast cars. My husband grew up 30 miles west of Daytonna, in the late 1950's. He loved to watch them race in the sand. Whenever we are in the Manassas area, we try and see a race. You'll love having this so close to your home. Wow, love the floor plans and the community, makes me wanna retire there now. I love history and the civil war is a fascinating time. The south is one of my favorite places. My uncle lived in Virginia when I was a kid, loved visiting. The people are so nice. Really retiring in the South and one like this, WOW its amazing. Great find thanks for sharing.